What if the kind of ride comfort you'd get on a large luxury SUV could be replicated - or even improved upon - in an affordable mid-sized model? Well that's what this car, Citroen's C5 Aircross, sets out to provide to 'Qashqai-class' folk. Citroen may have arrived late to this particular party, but at least it's trying to bring it something new. Here, we try the base Puretech 130 petrol version. 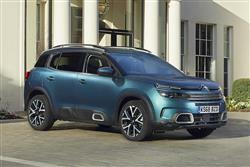 Citroen has been turning around its SUV fortunes and the little C3 Aircross, launched in Summer 2017, has sold well in the small supermini-derived SUV sector. 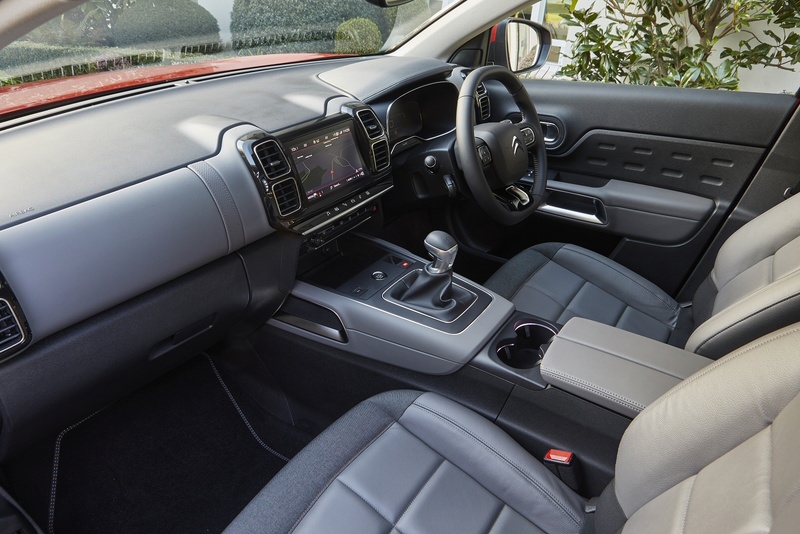 This family hatch-based C5 Aircross will be equally important in the class above and claims to bring 'an all-new level of overall comfort' to the segment. That comes courtesy of super-supportive 'Advanced Comfort' seats and a clever new suspension system using what the marque calls 'Progressive Hydraulic Cushions'. The C5 Aircross might sell itself to you in terms of its practicality too, though it's not large enough to offer a seven-seat option. Still, if that's not an issue and you're buying in this segment, there's plenty else to catch your attention. There are six connectivity technologies, nineteen driver assistance systems and thirty exterior colour combinations. Plus something we haven't seen before in this sector, a 'ConnectedCAM' dash cam camera. It's all created a five-seat family SUV that promises to be genuinely different. And we're going to try it in PureTech 130 petrol form. 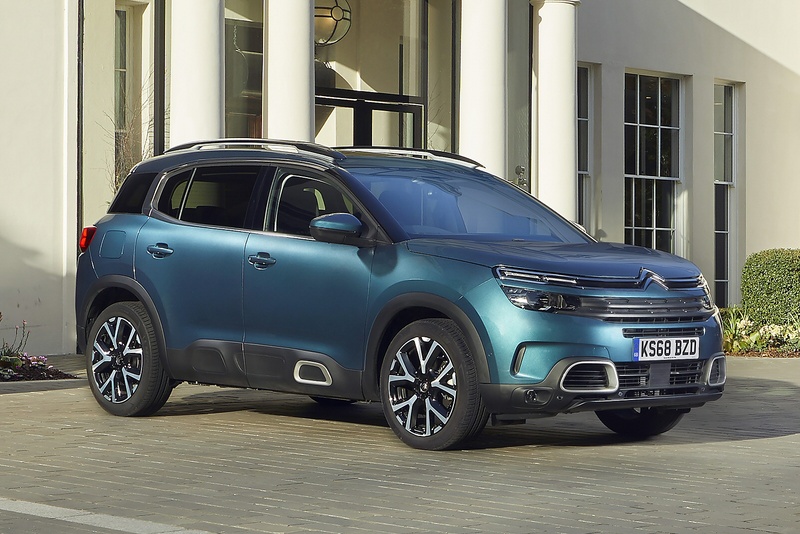 Set off in a C5 Aircross and one of the first things that Citroen hopes you'll notice is the impressive ride quality, embellished by a clever 'Progressive Hydraulic Cushions' suspension system which delivers class-leading comfort over poorer surfaces. Hydraulic dampers cushion the top and bottom of wheel travel at the top and bottom of wheel travel and allow the fitment of softer springs and dampers, producing what the brand describes as a 'magic carpet'-like feel. Thick quilted 'Advanced Comfort' front seats further embellish the feeling of Gallic luxury. The inevitable flip-side of that is that there's a little more roll through the bends than you'd get from an obvious class rival. But if you can ignore this, there's actually more grip and traction than you'd think, though the somewhat over-light electric steering does its best to disguise the fact. We tried the base 1.2-litre three cylinder PureTech petrol unit. This offers 130hp (more than you'd get with the base petrol engines found in some rivals) and seems on paper to offer a reasonable set of performance stats - rest to 62mph in 10.7s en route to 117mph. On the road though, the efforts of the little triple-cylinder powerplant are somewhat hobbled by the fact that the kerb weight of this SUV is likely to be up around 1.5-tonnes, once you've fitted a few extras. 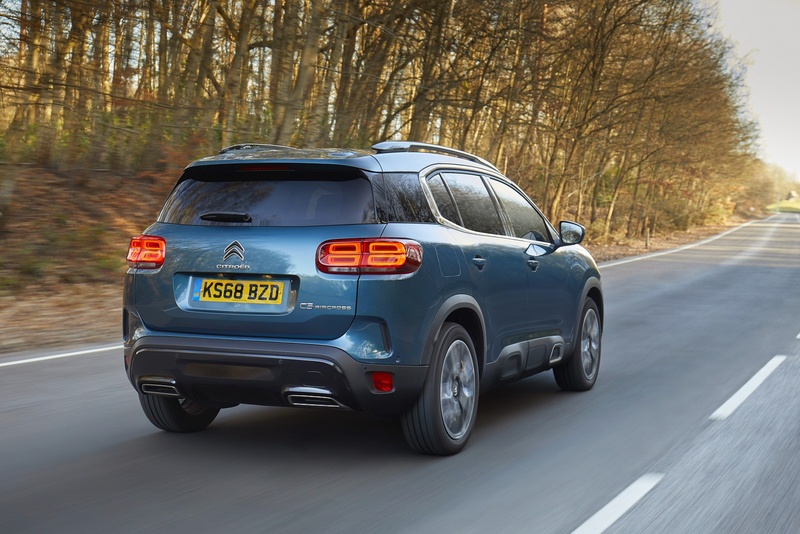 Citroen's not too dissimilarly-sized C4 Cactus hatch model is the best part of half a tonne lighter when fitted with the same engine: such is the penalty for fashionable Crossover credibility. 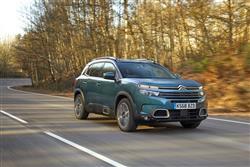 Citroen has carefully sized this C5 Aircross, making it a five-seat design but quite a large one, with a 4.5-metre length that slots it into the centre of the mid-sized SUV segment. Familiar brand styling features include this raised muscular bonnet and the usual Citroen two-tier lighting signature, with the top units housing the LED daytime running lights, the lower ones being for the headlamps. Buyers can colour-personalise the lower air intakes, the roof rails and the lower side sill 'Air bumps; in either red, silver or white. Inside, as with most modern Citroens, what you find is a mixture of interesting design, a few cheaper plastics and some clever electronics. Oh and lovely seats, with the ones you're most likely to get being of the generously proportioned 'Advanced Comfort' variety, which feature particularly broad bases, foam that's 15mm thicker than usual for extra support and extra quilted padding. The result is a feeling of cosseting Gallic luxury. The instrument binnacle is another cabin talking point, conventional dials completely replaced by a standard 12.3-inch colour screen that's fully configurable and customisable. Just about everything else you'll need to know can be found on the 8-inch centre-dash capacitive touchscreen. In the back seat you'll get what Citroen claims is the 'most modular' rear bench arrangement in the class. It's certainly very versatile, made up of three individual sliding, folding and reclining seats. Out back, you get a large 580-litre boot. So, let's get to the pricing, which from launch was pitched from around £23,500 for the base Puretech 130 petrol variant we're looking at here which comes only with manual transmission. C5 Aircross buyers are offered three pretty middle-of-the-road trim choices - 'Feel', mid-range 'Flair'-spec or top 'Flair Plus'. 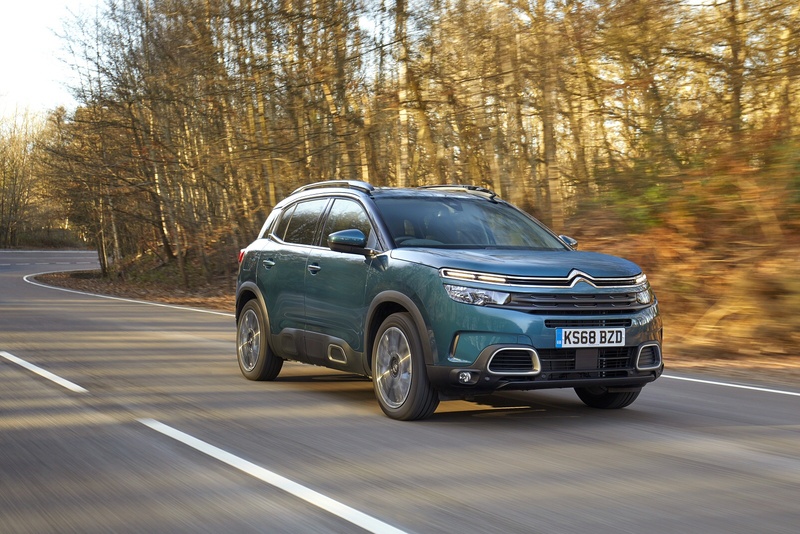 Standard kit on the base 'Feel'-spec version includes quite a bit but most C5 Aircross buyers in this country will find the £2,100 premium that Citroen asks to trade up to the mid-range 'Flair'-spec we tried. Models of this grade are recognisable by larger '18-inch 'Swirl' alloy wheels, rear privacy glass and chrome-effect exhaust trim. 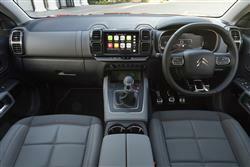 There are some key extra interior features at this level, amongst them the more supportive 'Advanced Comfort' seats and the 'Citroen Connect Nav' sat nav system that comes with 'TomTom Live' traffic updates and voice recognition. Plus there are useful features like front parking sensors, a 180-degree 'Visio Park' colour reversing camera, an electrochrome rear view mirror, a two-tone horn and 'follow-me-home' lighting that at night guides you to your front door. The cabin gets a classy upgrade too, the 'Metropolitan Grey Ambiance' package you get at this level giving you upholstery trimmed in a mixture of Grey Grained leather and 'Graphite' cloth. At 'Flair' level, you also get as standard what is probably this C5 Aircross model's most unexpected feature - the 'ConnectedCAM', the world's first built-in dashcam system. We're used to modern Citroens being rather light by class standards, particularly models that are, like this one, built upon the PSA Group's stiff, sophisticated EMP2 platform. So the news that the fastest and best-equipped versions of this C5 Aircross tip the scales at well over 1.5-tonnes may prepare you for the fact that in trading up from the brand's smaller C3 Aircross model (which is a massive 400kgs lighter), your running cost returns are going to be very different. Of course, many C5 Aircross buyers won't be switching from something smaller in the Crossover class and these people will merely be happy to see that this car's efficiency stats number amongst the better readings that you can expect to get from a mid-sized volume brand SUV of this kind. In evaluating them, we'll quote you figures based on readings calculated using the latest 'WLTP' ('World harmonised Light vehicle Test Procedure') cycle, but the stats have been converted back to the most recent 'New European Driving Cycle' 'NEDC2' spec, since that's what a lot of rival models are still using. The base 1.2-litre PureTech 130 petrol powerplant we're trying here is supposed to be able to manage up to 44.2mpg on the combined cycle and up to 119g/km of CO2. Which we'll put into perspective by telling you than a directly comparable 1.5-litre petrol Ford Kuga can only manage up to 35.3mpg and 160g/km. If you�re looking for a new Citroen C5 Aircross 1.2 PureTech 130 Flair Plus 5dr Petrol Hatchback for sale, you�ve come to the right place. 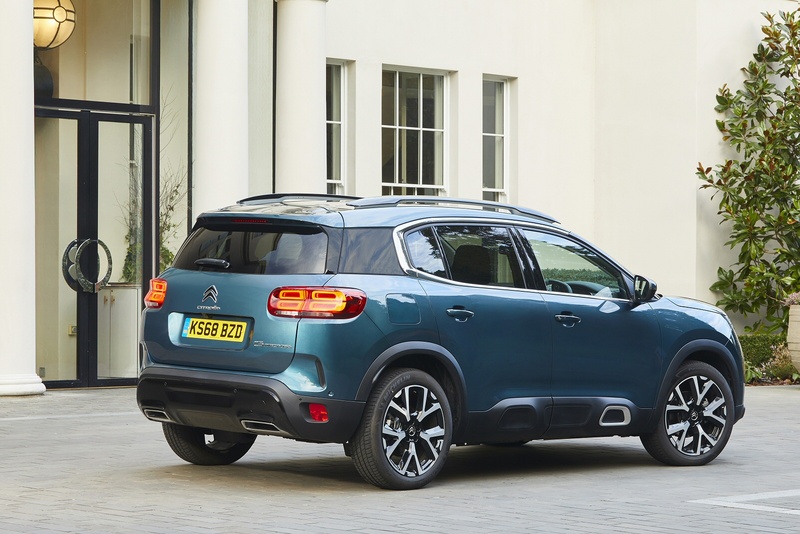 At Bristol Street Motors we don�t just have the best Citroen C5 Aircross 1.2 PureTech 130 Flair Plus 5dr Petrol Hatchback deals, we also offer friendly advice and help with all your enquiries to ensure your buying experience is a happy experience.